The San Francisco metro area boasted the second largest monthly home price gain in the country in April, the most recent S&P/Case Shiller Home Price Indices show. But for the first time in more than a year, the pace of annual appreciation dipped below 20 percent. Home prices in our region increased by 2.3 percent month over month, down slightly from March but still twice the rate of appreciation measured across the Indices’ 20-city composite. The report says San Francisco-area prices have risen for the past six months straight. But prices are slowing on an annual basis, Case Shiller’s data shows, with 19 of the 20 metro areas seeing smaller gains in April than in March. Year over year, the 20-city composite posted a price increase of 10.8 percent, but past reports indicate that annual appreciation has been declining each month since November 2013. The report says April’s 20-city composite price was back to levels recorded in the summer of 2004 but remains nearly 20 percent short of its 2006 peak. Slowing price gains across the country might actually benefit the housing market in the long run, columnist Neil Irwin writes in The New York Times. Irwin contends that if double-digit price gains persist, homes could become heavily overvalued. Home prices in the San Francisco region were up 18.2 percent year over year, second only to the Las Vegas metro area. The rate of annual appreciation in our region has dropped each month so far this year and was the lowest in April since January 2013. 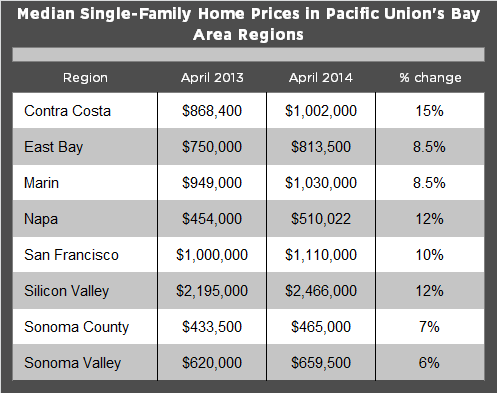 A look at MLS data as of June 25 shows that year-over-year single-family home price gains slowed from March to April in seven of Pacific Union’s eight Bay Area regions. In March four of our regions showed annual returns of more than 20 percent, with Sonoma Valley posting 42 percent year-over-year price hikes. But in April, gains ranged from 15 percent in Contra Costa County to 6 percent in Sonoma Valley. San Francisco was the lone Pacific Union region where yearly price appreciation was higher in April (10 percent) than in March (8 percent).